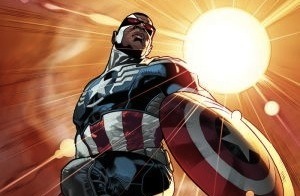 On Your Left, Steve Rogers: Sam Wilson is the New Captain America! This week saw the announcement that Marvel’s “Thor” book would replace its title star with a female Thor. Now, as revealed on tonight’s episode of “The Colbert Report,” Steve Rogers will pass the shield on to Sam Wilson (played in this year’s Captain America: The Winter Soldier by Anthony Mackie). The official press release is posted below along with new art of Wilson in the costume! Robbed of his superior strength and vitality, Steve Rogers must surrender his blues for a sturdy cane. He’s not about to fade away just yet though. The old maxims hold true: If dead men declared the war and old men talk about it, a young man must rise and continue the fight. If Steve Rogers can no longer hurl his mighty shield, then he’ll hand it to one who can carry it across the battlefield, above the clouds, to greater heights than ever before. This fall, Sam Wilson flies where eagles dare, as the intrepid Falcon assumes his new role as Captain America. A new chapter begins in ‘All-New Captain America” #1 by Rick Remender and Stuart Immonen. “This is it,” says Remender of the culmination of two years of storytelling in ‘Captain America’ and the dawning of “All-New Captain America”. “This is the fireworks factory we’re arriving at, and now everything’s going to blow up and be very pretty and exciting to look at. It leads into an evolution of Steve Rogers’ character that I had very early when I was given the job. I think that it’s important with these stories to do things that are natural and make sense and have an inherent logic to the universe, but are also constantly shifting and exciting, keeping the drama high. In order to do that it really comes down to creating new dynamics. 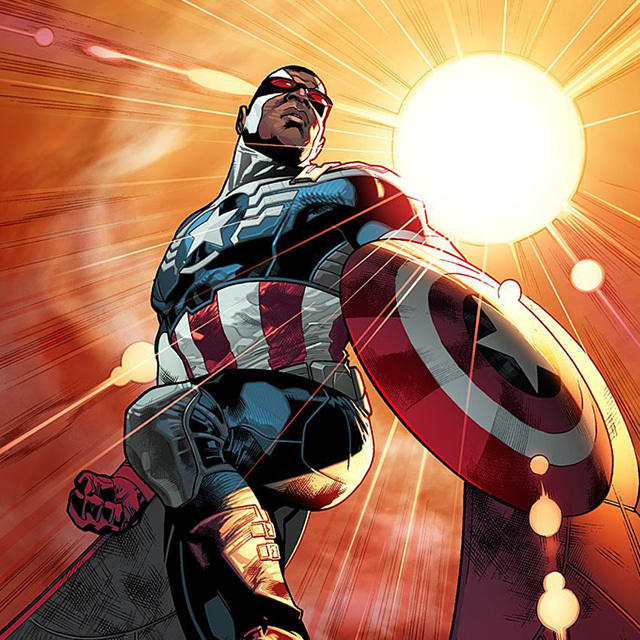 Remender paints a picture of Sam’s specially designed suit, incorporating the wings of the Falcon persona while still bearing the unmistakable stars and stripes of the Captain America role.